I am so excited to share some more Shimmer Polish with you! 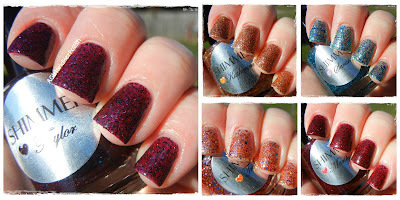 I have to admit, Shimmer is quickly becoming my favorite Indie glitter! I think after you see these reviews, you just might agree with me! Red Jelly Base with Green Mixed Glitter Polish! Just look at all this yumminess! Bronze Sandstone Polish! Fine microglitter. I love how the sun sparkles off this glitter! Look at how the sun gives it a hint of purple! Orange Cayenne Copper Glitter Polish! I love the hint of blue and gold! Vampy Burgundy Red Polish! Fine microglitter. These polishes are simply stunning! They are easy to apply and the formula is wonderful. I really need to add some base polishes and nail art! Wait until you see the other 5! These and more gorgeous glitters are available for purchase through the Shimmer Etsy Store! These are GORGEOUS! I hope you mention how it was taking it off with no base coat. LOL! I love all this polishes. Are gorgeous.